We are proud to announce that the amazing AIGA CO 25th Anniversary poster created by our longtime friend Stu Alden of Ink Lounge is now for sale! You can pick them up at our speaker events. Just purchase a poster for $25 when your purchase your ticket and we’ll have it ready for you at event check in. Quantities are limited, so make sure to get yours while you can. 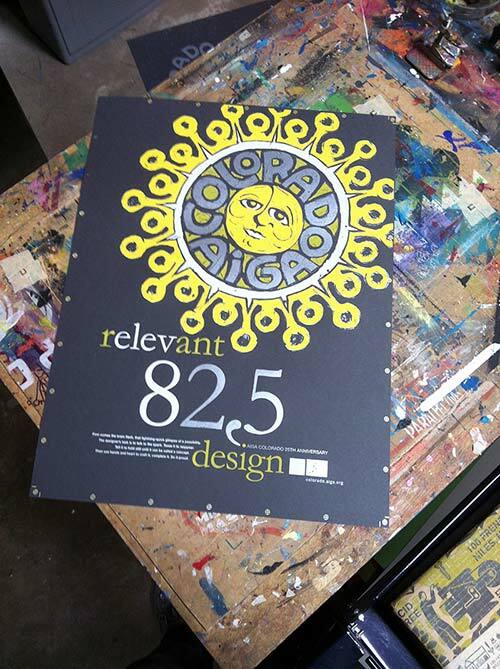 “I was honored to be asked to create a poster for AIGA Colorado’s 25th anniversary. At the same time, it’s always a bit daunting when designing a project where the intended audience is your peers, especially when I was told the concept was fairly wide open. But, I was also excited as they were willing to have me screenprint it as well. So after a few discussions with a few of the Directors, I provided a layout comp along with the following reasoning behind the concept. The purpose of AIGA is to elevate designers’ thinking about the design process, blended with how to make that design relevant to a specific audiences. 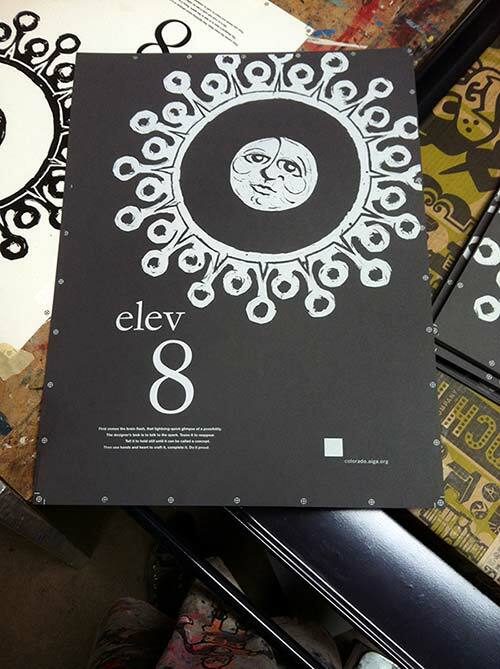 So using the world relevant, but then positioning the 8 under the V, you can also read elevate in the main title. 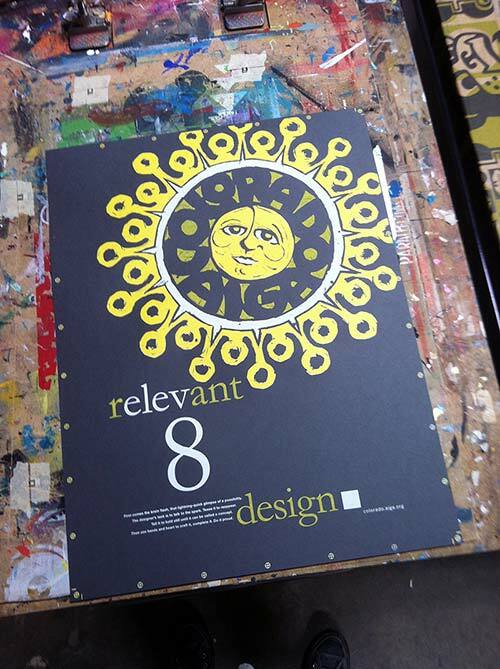 From there I illustrated the sun to represent rising/radiating ideas plus Colorado has a zillion days of sun. 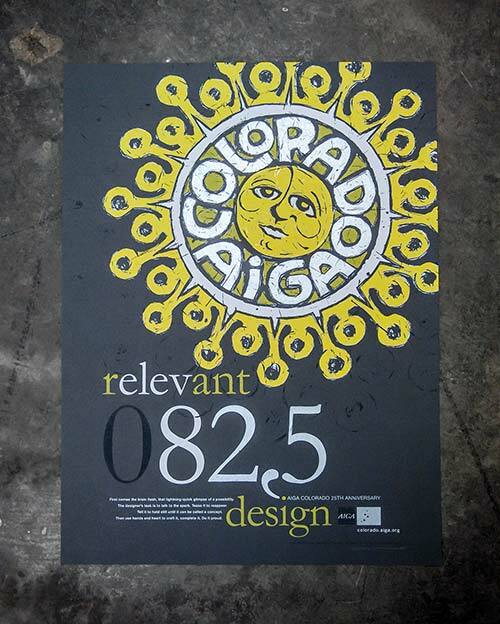 The numbers are simply 5,280 backwards, to represents the mile-high altitude – which also allowed placement of a big silver 25 on the poster, bringing us back to the silver anniversary of AIGA Colorado. Living in Colorado you might see the comma and recognize it’s 5,280 backwards, where others may ask – “why the numbers and backwards comma…?” Which also allows us a chance to speak to the concept of “elevating ideas/design/etc…” All in all, a design with multiple layers that may be a bit “challenging” to find all the meanings. But I reckon it wouldn’t be all that fun to design something that doesn’t require a second glance. Once I got approval I then switched roles from designer to screenprinter. As a designer it’s simple enough to move your color slider back and forth on the computer to get what you want; as a printer I spend a great amount of time mixing ink and testing colors on the paper to make sure I’m happy with the end palette before starting to print. From there I finalized the art, exposed the screens and spent the next few days hand-printing a 5-color, limited edition of 100 on French Paper.